Ship's captain: Commander Sugitani Nagahide  (prev. C.O. YAYOI). Assigned to Desdiv 27 (SHIGURE, SHIRATSUYU, ARIAKE, YUGURE), Desron 1, First Fleet. With SHIGURE (1st section, Desdiv 27) escorted convoys from Moji to Formosa and back to Kure. With SHIGURE, escorted ZUIHO from Yokosuka to Davao and back to Hashirijima. Desdiv 27 steamed from Sasebo to Mako (Pescadores) to meet SHOKAKU and ZUIKAKU, then escorted them to Truk. Commander Sugitani (to C.O. 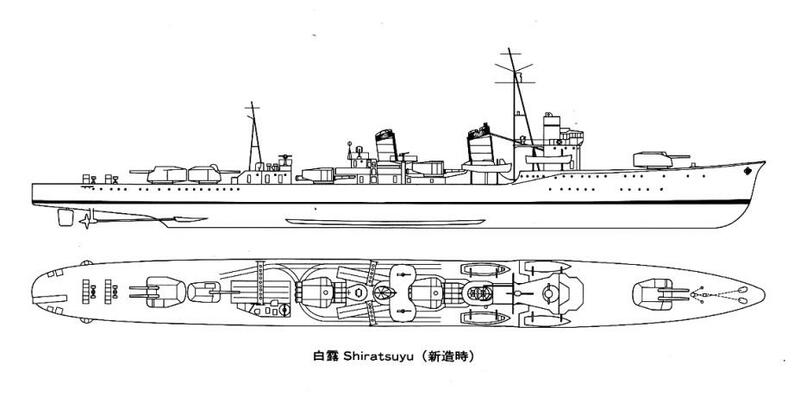 UMIKAZE) relieved by Lieutenant Commander Hashimoto Kanematsu  (prev. C.O. KAMIKAZE). Desdiv 27 escorted Admiral Takagi's Striking Force. With SHIGURE and ARIAKE, escorted MYOKO and HAGURO as distant cover to Ocean-Nauru occupation force; operation suspended due to detection of U.S. carrier force in the area. Desdiv 27 escorted MYOKO and HAGURO from Truk to Kure. Desdiv 27 escorted Second Fleet from Yokosuka to Truk. Desdiv 27 then temporarily attached to Fourth Fleet for strengthening of positions in Marshalls-area. Troop transport run from Truk to reoccupy Makin Atoll after U.S. raid. Out of Jaluit on Marshalls-area troop transport duty. Departed Jaluit, then scouted and bombarded Ndeni Island, looking for U.S. seaplane base. Then joined fleet patrolling north of the Solomons. Joined troop convoy at Palau then escorted it to Rabaul. Departed Rabaul, joined troop convoy from Palau, then escorted it via Rabaul to the Shortlands. With AKIZUKI and Desdiv 2, Desdiv 27 (minus YUGURE) escorted troop convoy (High Speed Convoy: SADO MARU, AZUMASAN MARU, KYUSHU MARU, NANKAI MARU, SAKITO MARU and SASAKO MARU, lifting units of 2nd Division) from Shortlands to Guadalcanal and back. KYUSHU MARU, AZUMASAN MARU and SASAKO MARU lost to air attacks and/or grounding, but all troops, tanks, and guns were successfully landed. Troop transport run to Guadalcanal: Desdiv 27 (minus YUGURE) made up one of five transport groups that between them carried 2,159 soldiers, 6 field guns, ammo, etc., to Esperance and Tassafaronga (Desdiv 27) and brought out evacuees. Attack mission to Guadalcanal; assisted in sinking USS SEMINOLE (AT-65) and YP-284 and damaging USS ZANE (DMS-14). Transport run to Lae/Salamua, aborted due to air attack. Removed survivors from bombed HAYASHIO and scuttled with torpedo. Troop transport run to Buna, aborted due to air attack. Medium damage: in attack by B-17s; direct bomb hit on bow; casualties light but flooding severe; best speed nine knots. Arrived Rabaul on 30 November for emergency repairs. Steamed from Rabaul to Truk, then more repairs. Steamed from Truk to Saipan, then more emergency repairs. Desdiv 27 reassigned to Desron 2, Second Fleet. With AKEBONO and USHIO, escorted UNYO from Yokosuka to Truk. With AKEBONO, USHIO, NOWAKI and MAIKAZE, escorted UNYO from Truk to Yokosuka. With AKEBONO, NOWAKI and MAIKAZE, escorted UNYO from Yokosuka to Truk. Lieutenant Commander Hashimoto (to C.O. KAZAGUMO) relieved by Lieutenant Commander Matsuda Kuro  (prev. C.O. HASU). Escorted MAMIYA from Truk to Yokosuka. Escorted convoys from Yokosuka via Truk to Rabaul. Attack mission to Bougainville; engaged U.S. cruiser-destroyer group. Medium damage: in collision with SAMIDARE; later strafed by aircraft; torpedo tubes and main battery director knocked out; four dead, two wounded. Escorted MYOKO, HAGURO and TONE from Kure to Truk. Escorted MYOKO, HAGURO and TONE on troop transport run from Truk to Kavieng (4 January) and back. Escorted convoys from Truk to Yokosuka and back; on 31 January rescued survivors of torpedoed YASUKUNI MARU. With MICHISHIO and TAMANAMI, escorted MUSASHI and OYODO from Truk to Yokosuka. Escorted MUSASHI from Yokosuka to Palau. Escorted MYOKO, HAGURO and tanker convoy from Palau to Balikpapan, then escorted convoy back to Palau. Escorted MUSASHI from Palau to Kure. Escorted convoys from Shanghai-area via Manila (Take troop convoy), Bangka and Balikpapan to Tawitawi. Troop transport run to Biak (cover), aborted due to enemy interception. Minor damage: in air attacks due to strafing; four dead and five injured; later engaged Allied cruiser-destroyer group; then via Batjan to Davao on 12 June. Departed Davao, escorting 1st Supply Force. Sunk: in collision with tanker SEIYO MARU 90 miles southeast of Surigao Strait (09-09 N, 126-51 E), after which depth-charges exploded among survivors; 104 killed, including Lieutenant Commander Matsuda, and eight wounded.